Earlier this month, we saw a Yamaha YZF-R15 undergo an extreme makeover to imitate the BMW HP4 Race. Recently, we came across a TVS Apache RR 310 from Bengaluru that also tries to mimic the styling of the German litre-class motorcycle. The changes, however, are limited to the livery while the design and almost all the hardware are in stock condition. The BMW HP4 Race inspired livery on the TVS Apache RR 310 gives the motorcycle a refreshed look. The BMW HP4 Race inspired livery on the TVS Apache RR 310 gets white as the base paint with blue and red highlights. The fairing features HP4 Race sticker among others. Carbon-fibre stickers to the fairing and the front fender add a sporty touch to the motorcycle. TVS branding has been removed from the motorcycle. Instead, the fairing and the engine dons BMW badge. To give the rear a minimalist look, the fender, numberplate holder and blinkers have been removed. As mentioned in the video, a Kawasak Z800 sourced exhaust replaces the stock unit. The TVS Apache RR 310 continues to feature standard design and hardware. Thus, you would spot the factory installed all LED lighting on the motorcycle. It retains the aerodynamic fairing that has been developed through wind tunnel testing, and is claimed to have a drag coefficient of 0.26. There was no mention of any changes to the mechanical specification of the motorcycle in the video. 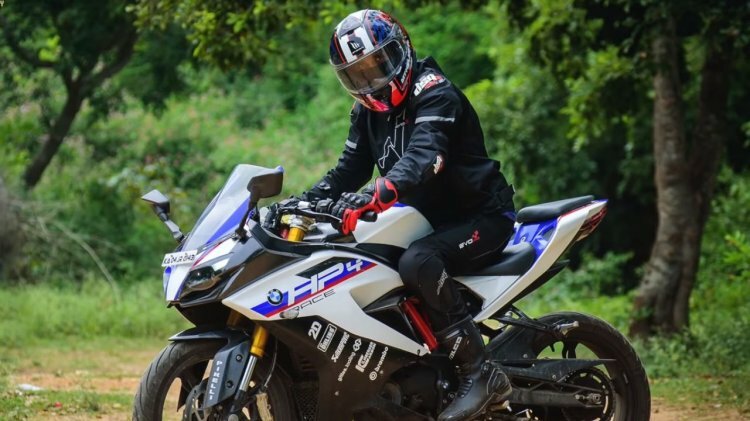 In the factory state of tune, the 312 cc, reverse inclined, single cylinder, liquid cooled, 4-valve fuel injected (Bosch - Closed-loop EFI) engine on the Apache RR 310 is tuned to produce 34 PS of maximum power at 9,700 rpm and 27.3 Nm of peak torque at 7,700 rpm. This engine is paired with a six-speed transmission. Accelerating to 60 kmph from a standstill takes 2.92 seconds while 0-100 kmph comes up in 7.17 seconds. The claimed top speed is rated at 160km/h. A 300 mm Petal-type single disc up front and a 240 mm Petal-type single disc at the rear provides the stopping power while the safety net of ABS comes as standard. Shock absorption tasks are performed by inverted cartridge telescopic fork up front and Mono tube floating piston gas assisted shock absorber at the rear. The TVS Apache RR 310 was launched in India in December 2017 at INR 2.05 lakh (ex-showroom). However, the motorcycle received a price hike of INR 8,000 in just four months post its launch.